Our theme was ooey gooey bakery treats. So this set instantly came into my mind BIGGEST WISHES from Clear Dollar Stamps LLC: http://mothermark.blogspot.com/search/label/Teapot%20Tuesday%20Cards. I cut the candle off the top because of the firecodes at the wedding. Oh yeah, did I tell you, this is a wedding card. That is why I used glitter, dimensional glaze and my special silver flowers. 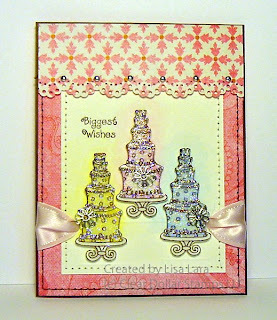 I made my card look like a gourmet bakery window of wedding cakes. At least that was what I was going for. My watercoloring definitely needs work. I'm learning as I go. WHAT A BEAUTIFUL, SPARKLY, YUMMY WEDDING CARD! I LOVE IT! LOVE THE PINK, YELLOW AND BLUE! This is adorable! Love how you put the little charm accents on the cakes and how you so softly sponged the color in them. I like how the ribbon comes in teh sides and hides behind the main panel.